Richard George Adams was an English novelist best known as the author of Watership Down. He studied modern history at the university before serving in the British Army during World War II. Afterward he completed his studies and then joined the British Civil Service. 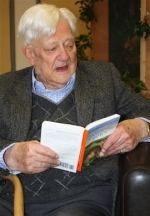 Two years after Watership Down was published, Adams became a full-time author. The Tyger Voyage, La Corona and the Tin Frog and The Patchwork Cat in a slipcase. Nineteen tales the rabbits of Watership Down tell. Two tiger brothers set out on a voyage around the world and have many adventures before they come home again. Two tyger brothers set out on voyage around the world. This is a miniature edition. The rabbits of Sandleford Warren set out to find a new home on Watership Down. The rabbits of Sandleford Warren set out to find a new home on Watership Down. This edition includes maps drawn by Pauline Baynes. The cover art was first used for the 1973 Puffin edition.